What is the best form of wildcard indication in UI? Can anyone help me figure out what is the best way to represent that wildcards are allowed in a field? Also, is there a best practice to represent 'enter exact match' as well? It all depends on preference, however, considering all odds we'll take a look at each option and pick the best, worse of all. The input label could easily be confused with the wildcard hint at such its a no-no. This would have been a great option, only that if the field is compulsory and/or its possible to have an error, this error; when indicated will be confusing alongside the wildcard hint, because from research and usability trends errors in inputs are best indicated beneath the input type. Wildcard hint as a placeholder makes a lot of sense, however after the input box in this case, has been loaded with data it disappears, resulting in no persistent guideline for the user to follow, but then, this could easily be fixed by reiterating the wildcard hint when the error pointed out in Option B is visible. Summary: Option C is the best, worse of the three. Form Label - disabled or enabled? What is the best way to show conditional fields? 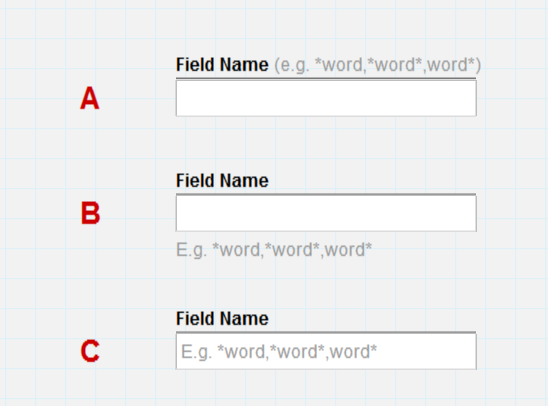 What are the best practices for representing a boolean field in a form? Where to place controls in user account form?